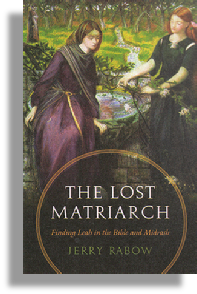 The Lost Matriarch takes on the curiously sparse biblical treatment of the Matriarch Leah, a character who paradoxically plays one of the central roles in the Book of Genesis and in the history of the Jewish people. With the help of Midrash (classical commentary) and the application of traditional midrashic techniques to analyze biblical text, you’ll enter into the delightful world of rabbinic and literary commentary that expands—perhaps it’s fairer to say “creates”—the story of Leah. The Lost Matriach is not a book of theology or dogma. It’s a book of literary analysis that will deepen your delight in reading the Bible as an adult. While it reveals Leah’s fascinating story, this book will also effortlessly empower your entire approach to reading the Bible by introducing you to the content and methodology of classical and contemporary midrashic commentary. The Jewish Publication Society/Univ. of Nebraska Press released THE LOST MATRIARCH on September 1, 2014. You can read more about the book in the JPS catalog, or download excerpts from the Preface and Introduction (pdf file). Belong to a Book Group? Look at some suggested Questions for Discussion for Book Groups. For teachers: If you’re interested in leading a multi-session adult education or college course on “Crisis and Character in the Story of Leah,” I’d be pleased to furnish an extensive course Syllabus and Study Materials, including excerpts from Talmud, Midrash, and literary commentary, together with an expanded set of suggested discussion questions. Book Events: I’ve enjoyed leading book talks, study sessions, and book club meetings about Leah for synagogues, colleges, adult education groups, and private study groups. Initial dates are listed to the left. And please check back on this site soon for updates on opportunities to attend public talks in your area, as well as other new developments for The Lost Matriarch. Oct. 28, 2014: Holy Blossom Temple, Toronto, Ont. * Watch a video of the starred talks on the Media Page. (2) Videos of some of my talks about Leah can be viewed on the Media Page. (3) And for reviews, postings, and reader comments, go to Reviews and Comments (and consider adding your own comment).